First up, in the slideshow at right, are some pictures that were taken during the tunnel’s construction. Below, you’ll see a photograph that was snapped during the tunnel’s open house and grand opening celebrations. As you can see in this slideshow, the open house, which was held in the days leading up to the Aug. 10, 1990 grand opening, was a chance for people to see inside the tunnel before it was open to vehicle traffic. 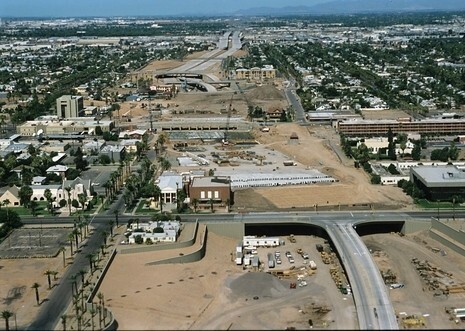 The public was invited to walk, ride and visit the unopened freeway. On Aug. 10, there was the formal ribbon-cutting ceremony attended by a number of government officials. See more grand opening photos.Finally, in this slideshow, you can see what the tunnel looks like today. There are even a few behind-the-scenes shots that show off the ventilation fans, control room and the space that was meant to be an express bus lane (it never was used for that purpose and is gated off from vehicles). By the way, if you’re interested in the tunnel’s operations, you’ll want to stay tuned … we’ve got more details coming for you in the months ahead. Until then, you can check out all of our previous tunnel posts to learn more. You’ll also find an extensive look at the Deck Park Tunnel’s history in “The Final Mile,” a document that was published by ADOT to commemorate the completion of Interstate 10.